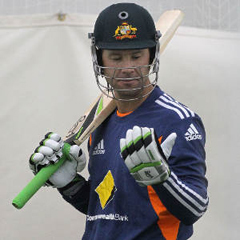 Brisbane - Senior batsman Ricky Ponting plans to step up sprint work to prove his fitness from a hamstring injury ahead of Friday's opening Brisbane Test against South Africa. Ponting withdrew during last week's Sheffield Shield game for Tasmania with hamstring tightness, but said he was feeling better two days out from the Gabba opener with the top-ranked Proteas. "I came down early and did 20 or 30 minutes of running before the boys got here today which is part of the process the physios have mapped out for me for the next few days," Ponting told reporters on Wednesday. "I'll probably ramp things up a little on Thursday with a bit more intense running with some sprint work and another full-on hit in the nets. "I didn't feel anything with it today so I expect to be right." As skipper Michael Clarke muses over the final make-up of his bowling attack, the heat was on in the practice nets on Wednesday as the battery of fast bowlers went about their work to impress selectors. Clarke took a blow on the wrist and had his hand in a bucket of ice following his net session. "The boys (bowlers) have been going exceptionally well trying to impress and that's good," former skipper Ponting said. "That's the sort of intensity we have come to demand around our net sessions now. "When we train, all the bowlers are going flat out and they've got new balls and all the batters are making sure they get through their first 20 balls in the nets." Meanwhile, opener Ed Cowan goes into the first Test under pressure to hold on to his Test spot with top-order batsman Rob Quiney to make his Test debut for injured allrounder Shane Watson. Cowan is averaging 29.83 and is feeling the heat at the top of the Australian batting line-up with Watson expected to return at number three once he recovers from a calf muscle injury. "There's always something to prove in the Australian cricket team," Cowan told reporters. "Seven Tests now is a point in time where you know what Test match cricket is all about and what you need to get to that point in peak performance. "At no stage have I felt out of my depth. I probably haven't performed as well as I'd have like to in terms of getting myself in and not going on and getting a match-winning score. "I feel like I belong in the team at the same time and that ultimate belief comes from actually winning the game off your own bat." Cowan has made three half-centuries since debuting in last year's Boxing Day Test against India when he batted through to tea for a gallant 68.